SUMMARY: When startup company emaze first launched, the brand wasn't sure who was going to become its paying customers. A sample of the users interacting with a freemium product brought surprising results. This MarketingSherpa B2B Newsletter case study looks at how this presentation software startup utilized B2C tactics in the freemium release of its basic product to convert its B2B user segment. The company utilized its freemium B2C user segment for lead generation via its brand advocacy instead of closing deals with a traditional sales team. Emaze is a startup company that produces online presentation software and offers a variety of templates to help its users get started. When it launched, the company wasn't sure who was going to become its paying customers. Daniel Glickman, CMO, emaze, said the beginning strategy was to let everyone use the product for free and then ask all users to begin paying. While business users — from mostly small businesses — make up its key target audience, the company also has a significant user base for educational and personal use of the software. Glickman said the business user segment could be further broken down into startup companies, social mid-level executives and some corporate users, although emaze wasn't focusing on the corporate audience. One challenge in marketing the software was that there is no set job title the messaging is designed to reach. Glickman demonstrated this by describing one of emaze's customers — a CEO of a company. However, in working with the company, he realized that the CEO's personal assistant was the person at the company who was actually creating presentations. He said, "The CEO is the end user. [The personal assistant] is also an end user. You can't target that in an organization. How are you going to map that out?" Another challenge, one faced by many startup companies, is limited resources. In emaze's case, this led to an out of the box approach to its entire business model and lead generation strategy. Glickman said, as a startup company, emaze decided to sell its product differently than most B2B companies while also selling its product in a way that kept sales costs down. He said the company tried a traditional approach with a sales staff but found it wasn't effective in driving scalable growth. At the same time, the startup knew it had a large number of users creating presentations for education or personal use who would likely never upgrade to a premium version of the software. The discovery of the two segments led to the decision to make the basic product a freemium for all users, business or otherwise, with no limit. This meant the two segments would receive different messaging. The business users were encouraged to upgrade to the premium software and were provided information about the benefits of upgrading. The education segment would only receive messaging with tips, hints and other product information with no pressure to upgrade. The idea, Glickman said, was to make use of the freemium consumer marketing tactic and turn those education and personal users into brand advocates for emaze's presentation software. It was understood that this segment would very likely never become paying customers, but they would create presentations featuring emaze branding and share their presentation with others who might be in the market for the premium business version of the software. Glickman said about this segment, "They are our sales team essentially. They are working for us by spreading the word, by showing our logo in whatever they do." Early in the process of launching its presentation software, emaze realized that business users were converting at a much higher rate than education or personal users. From there, the decision was made to target its marketing to those users. Another decision was to send the different segments different messaging — business users would get messaging on upgrading to the premium product while other users would only receive informational messaging with no pressure to upgrade. "We are marketing to those that are high conversions," Glickman said. "Once they signed we have to make a very quick decision. Are we trying to sell, or are we just letting them — and encouraging them — to use this software as much as possible and give them the right to spread the message for others?" He added that within the business user segment, emaze's current, more refined target audience is startup companies. This is because startups often have a vested interest in creating presentations that stand out from the crowd as they seek funding and send pitch presentations to potential investors. Glickman said one challenge was asking someone to switch from a presentation software they were used to for something new. The team pinpointed life changing events as one such situation in which a customer would be willing to switch software. For example, he said, "''When you are presenting to an investor, for instance, that's a big thing, and your life kind of depends on it … people will take the effort to learn a new software." Glickman said he believed that a lot of B2B companies that have reached a certain growth stage aren't interested in providing free accounts and instead want to push prospects into speaking with a traditional sales team. He added that he felt this approach didn't take advantage of the fact that the product is online and constantly running. "We had, in the beginning, questions about … what is the difference between the free and the premium. And if the difference is not presented well, then you're not going to monetize," he said. Emaze found a branding strategy for the premium product that immediately garnered positive results. Glickman said simply naming the premium account the "business plan" was a success. He added that even though the basic software was a freemium with no limit, B2B prospects were essentially using the freemium as a free trial that happened to be unlimited. Even though anyone, business user or not, could open and maintain a freemium account on an unlimited basis, the team realized some B2B prospects preferred a limited free trial of the premium product instead of using the scaled-down product for free indefinitely. Glickman said, "We started getting signals from a lot of people who said, 'I wanted to try your software out, but I have to pay for the privacy and so I didn't try it.' We realized that's not freemium. From [the prospects'] perspective, they want a free trial." Those prospects wanted to be able to check out the features that differentiated the premium package from the freemium product. The answer was to add a 30-day free trial offer to the premium software. Glickman said this resulted in an increase in conversion with a low cancellation rate. "They just want to try it. They can pull out their company credit card and pay right away," Glickman said. Utilizing incentives to encourage certain actions is a common marketing tactic, but emaze found out its audience didn't respond to incentives. For emaze, offering incentives seemed to "destroy the process for us" Glickman said. The company attempted to employ incentives by encouraging freemium users to post photos to social media platforms such as Twitter. In return, they would get free access to the premium version of the software. Glickman said this approach achieved very low percentages of success. He said the team initially thought freemium users would share their presentations. People would then see the company logo on those presentations and prospects would then be able to find emaze. In fact, Glickman said that around 70% of emaze's sign-ups are organic. He said that the "vast majority" of those were through word of mouth rather than exposure to the brand through sharing. The team believed that the incentive program didn't work because non-business freemium users appreciated that the software was free — they weren't getting bombarded with marketing messages to upgrade and weren't being asked to do anything more than just use the product. Those users were willing to share without an incentive to upgrade because they didn't have any interest in upgrading. He said that there was a company focus to provide a great product, and "making sure that they realize, okay, for them it's free. For business, it's not. They know, 'Okay, I'm safe. They are not going to be bugging me all the time.' They know, 'It's free for me because I'm not a business.'" The team believed that feeling of safety from upgrade pressure made users happier to talk about the product to other people who might become B2B prospects. Knowing that there were two main user bases for the freemium product — business users who might upgrade to the premium version and others who were most likely never planning on upgrading — the team needed a way to immediately segment those freemium sign-ups so they could begin targeting the business user who was more likely to convert. 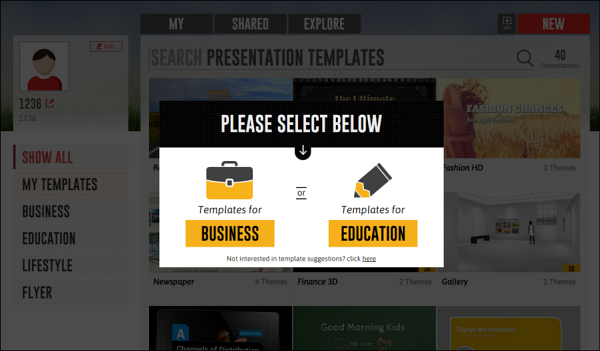 This was achieved with a pop-up box at the moment of sign-up, asking the user to select whether they wanted templates for business or education. In much smaller font, there was a third option for users who didn't want to select template suggestions, essentially offering anyone signing up an opt-out of self-selecting what type of user they were. After sign-up and self-segmentation, new users received emails tailored to their segment. 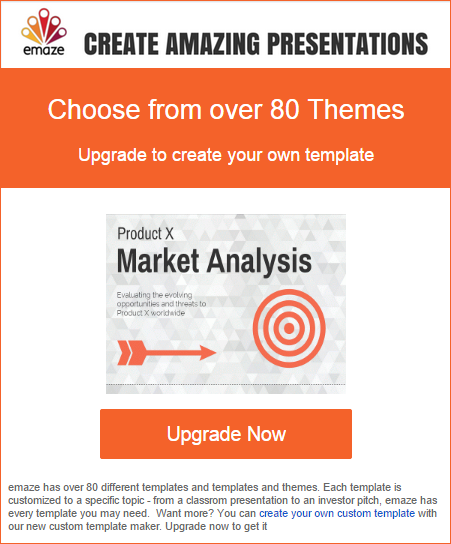 People who chose to receive education templates received emails that showed product features and explained how to create presentations. People who chose business templates received messaging that included calls-to-action to upgrade to features such as the ability to create their own templates. Glickman said most upgrades to the premium product happened within four or five hours, and the cutoff point for upgrades was typically several days. Knowing that, the team created a lead nurturing email program to encourage business users to upgrade that only lasts five days. After that, the emails sends are limited to informational newsletters with no call-to-action to upgrade. Glickman said part of this strategy was to retain existing freemium users by not hounding them to upgrade to the premium product. In the ongoing email sends, the education and business segments receive different, but very similar messaging with product tips, contests and other informational messaging. The slightly different messaging reflected that the two audiences were different user bases — one business and the other education. The rapid growth of new users reflects emaze's goal of creating a large number of "brand ambassadors" using the freemium product, sharing presentations with emaze branding and providing word of mouth testimonials, essentially serving as an unpaid sales force. In describing his key takeaway from the effort, Glickman used a common startup term — disruption. "When you think of disruption, you have to open your mind also to disruption in business models," he said. "And it's not always the fancy, highly different or visible stuff that counts. It's sometimes simply doing things differently than your competition in terms of your model. So in our case, it's taking B2C (via the freemium business model) and putting it within B2B." By bypassing a traditional sales team pursuing qualified leads, emaze is allowing its substantial (and growing) B2C user base to advocate its brand and product. This essentially serves as the main lead generation engine for bringing in potential paying B2B customers who become business users of the freemium product.